Today, 25 years ago, Hubble finally left Earth aboard the Space Shuttle Discovery after decades of planning and development. Its journey was fraught with problems and delays, but it ultimately rose above it all to bring us groundbreaking scientific discoveries and historic photos of planets, galaxies, nebulae, space dust and more. Hubble didn't only outlive its original 10-year lifespan -- it became the Michael Jordan, the Madonna of telescopes. If you're a movie fan, you've likely seen it on screen at least once. If you're a metalhead, you might have seen at least one of the photos it captured on an album cover. Even people with zero interest in space know its name. The Hubble Space Telescope (HST) is an 11-ton device that's the size of a bus. It orbits the Earth at an altitude of 340 miles, or around 100 miles above the International Space Station, and reaches speeds of 17,000 miles per hour. That's enough to circle the whole planet once every 97 minutes, roughly 15 times a day. The telescope is equipped with solar-powered instruments that can capture photos of space in visible light, ultraviolet (UV) and near-infrared wavelengths. However, if Hubble were ground-based, many of its instruments would be pretty much useless. They work well because they're located beyond the Earth's atmosphere, which distorts our view of the universe. From the ground we are unable to view any significant amounts of ultraviolet (UV) light because of the ozone layer. Space telescopes equipped with the right instruments can be used to study nearby star-forming regions by the UV light they emit. Certain parts of the infrared spectrum are also best studied from space, and by looking at these wavelengths astronomers can study galaxies in the very early universe. HST is one of NASA's four Great Observatories, along with Spitzer, Compton and Chandra. Spitzer carries infrared and far-infrared equipment; Compton specializes in gamma ray; while Chandra is an X-ray observatory. The telescope carries a number of scientific instruments and cameras that analyze data and capture stunning space photos, respectively. Those cameras can't take pictures on their own, though -- similar to how ordinary cameras need lenses, the ones on Hubble need the telescope's mirrors to work. Hubble has a big primary mirror measuring 7.9 feet in diameter -- with telescopes, the bigger the mirror, the better -- which reflects light to a secondary one. That light bounces back to the center of the main one, where there's a hole leading to the scientific instruments. The cameras then capture what the mirrors reflect in black-and-white. All the bright, colorful photos NASA and the European Space Agency (ESA) regularly release are actually composites of two or more exposures with colors added during post-processing. While talks of building a space telescope began in the 1940s, HST's construction didn't take place until the late 1970s. It made such a huge dent (over a billion dollars) in NASA's budget, that the agency had to ask its European counterpart for additional funds. The ESA provided one of Hubble's first instruments and solar panels as well, guaranteeing European astronomers at least 15 percent of the telescope's observing time. The building process wasn't as smooth as NASA had hoped, and the agency had to stop construction several times due to issues with one of the contractors. HST finally blasted off from Cape Canaveral in April 1990, but the agency's problems didn't end there: Scientists quickly realized that there was something wrong with the telescope when the first photos it took came out fuzzy. The culprit? A barely noticeable, but serious optical defect known as spherical aberration. "This means that the outer edge of the mirror was too flat by a depth of only four microns, which is less than the thickness of a strand of hair," Robert Arentz from Ball Aerospace explained to us in an interview. Ball Aerospace built most of Hubble's instruments, as well as the set of movable, curved mirrors called Corrective Optics Space Telescope Axial Replacement (COSTAR), which served as a fix to the spherical aberration. That four-micron flaw was a huge problem, as you can see above. Thankfully, Hubble was designed to be repaired and upgraded by astronauts while in orbit -- it's the only space telescope made to be serviced, actually. So in December 1993, a crew was able to fly out and attach the additional mirrors. Installing COSTAR was "an extreme technical challenge," Ball Aerospace Senior Program Manager John Troeltzsch told Engadget. It had to be packed securely in a box the size of a phone booth to survive the space shuttle launch. And then, an astronaut had to spacewalk and install it "into a precise position to one-tenth of a millimeter" using a robotic arm. COSTAR was taken down during the fifth and last Hubble servicing mission in 2009, as all of Hubble's instruments now come with built-in correctors for the aberration. That same mission brought a few new instruments on board, though, including the Wide Field Camera 3, which has better resolution and a larger field of view than any other Hubble camera. 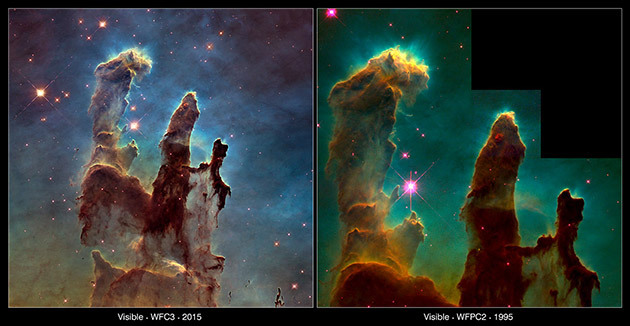 It seriously leveled up the telescope's ability to take impressively clear photos -- just compare the 2015 version of the Pillars of Creation to the one taken in 1995 to see what we mean. WHO USES AND MAINTAINS HUBBLE? It's not just NASA and ESA scientists that can use the telescope to study the universe. NASA gets over a thousand proposals each year from researchers all over the globe. A panel goes through that pile to determine which studies to undertake, and the chosen teams get exclusive access to the data they requested for a year before it's released. 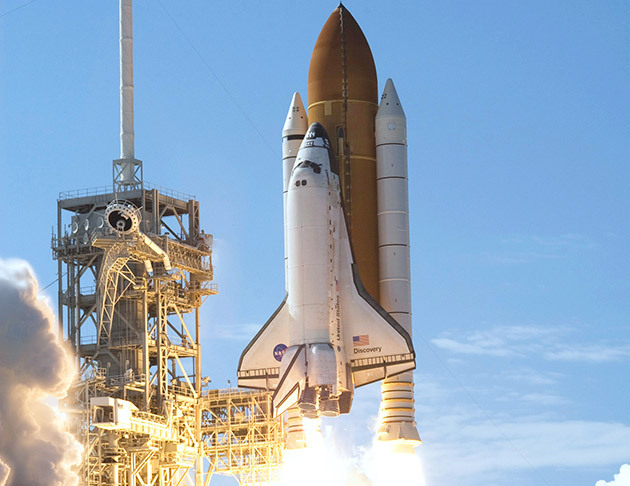 Since NASA's space shuttle program shut down in 2012, there won't be any more servicing missions. The six instruments on board right now, including cameras, spectographs, spectrometers and sensors (all powered by sunlight), will remain with Hubble as they are until the end. There is, however, a dedicated team of engineers and computer scientists from the Goddard Space Flight Center and the Space Telescope Science Institute (STScI) that continues to monitor HST's health and performance from Earth. The folks at Goddard also get the first look at any and all data Hubble's computer beams back to the ground station, before it's forwarded to STScI. Scientists from the institute are in charge of converting data into units we can understand, such as wavelength or brightness, and uploading those details to the internet for researchers everywhere. 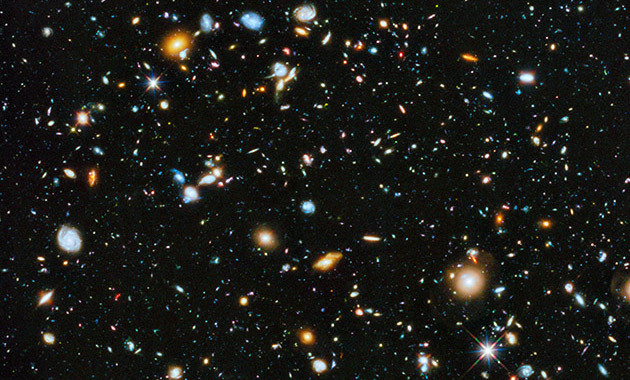 Thanks to Hubble, we're able to travel back in time in a way, as the photos it takes show the state of the universe way before our own solar system even existed. The Hubble Ultra Deep Field survey, which took a visible-light image revealing some of the most distant galaxies we've ever seen, is a favorite among scientists. To conduct the study, NASA had to locate an empty patch in the sky that was so tiny, the agency compared it to peering through an 8-foot-long soda straw. NASA periodically positioned Hubble to stare at that spot for over 10 consecutive days, several times over the years. The image above is the sharper, livelier 2014 version of the Ultra Deep Field -- the 2004 iteration looks bland in comparison -- using a composite of images taken from 2002 to 2012. Due to the galaxies' distance and the time it takes for light to reach us, the resulting image shows young galaxies as they were forming around half a billion years after the Big Bang. Hubble's observations of a special type of star also provided the data needed for a more accurate estimate of the universe's age. It's apparently around 13.7 billion years old, instead of 15 or 16 billion years like scientists previously thought. HST found strong evidence that supermassive black holes exist in the center of galaxies and pinpointed the color of an exoplanet for the first time, as well. More recently, it helped scientists find proof that there's most likely an ocean underneath the ice crust of Jupiter's biggest moon, Ganymede. Hubble also expanded our understanding of stars' life cycles and established the amount of dark matter in the universe (three-fourths of the universe's mass!). Like many NASA projects, technologies developed for Hubble gave rise to several spinoffs. For instance, the developers of the famous da Vinci surgical robot incorporated what they learned from the observatory's robotic arm and other tools into their creation. Same goes for the Canadian developers of another robotic surgeon called neuroArm. One of the components of a Hubble instrument called the Space Telescope Imaging Spectrograph (STIS) became key to the development of a piece of breast cancer-detecting equipment. HST also helped improve micro-endoscopes and even gave Goddard scientists the know-how to create an advanced blade-sharpening tool for ice skates. Dry your tears, fellow space lover: You don't have to bid Hubble farewell right now. It's old in telescope years, but it's still powerful, and some scientists believe its components and instruments can last until 2020. At the moment, it's still involved in several projects, including an incredibly ambitious undertaking called The Frontier Fields, which also uses fellow observatories/telescopes Spitzer and Chandra to peer at distant clusters of galaxies. 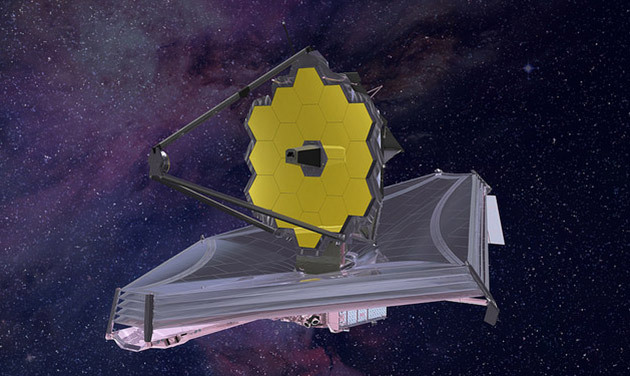 In 2018, HST's successor, the James Webb Space Telescope, will start making its way to orbit. This newer, more powerful and expensive observatory will be as big as a tennis court with a mirror almost three times the diameter of Hubble's. It will also orbit the Earth from a far greater distance, around 930,000 miles, or almost four times farther than the moon. Unlike Hubble, which works best with visible and UV light, James Webb will be optimized for infrared light, making it Spitzer's successor, as well. Its ability to see in infrared better than its predecessors "means [it] will be great at looking through dusty parts of the universe like the places where stars and planets form," according to McCarthy. That "also means [James Webb] will be able to see further back in time and space than the HST." 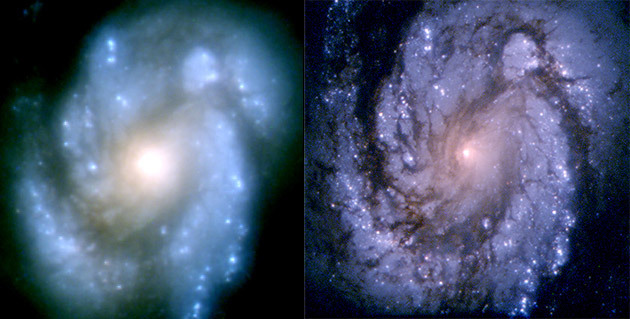 While there might be a few years of overlap, Hubble will inevitably give out someday. Radiation from the sun is one of its biggest enemies, as it's bound to break down the telescope's components over time. NASA originally wanted to bring it back to be displayed in a museum, but alas, it was specifically built to attach to a space shuttle. A modern-day rocket can't bring Hubble back safely, but it can guide the telescope into a fiery reentry straight into the ocean. It can also boost HST's orbit altitude to leave it floating in space for a few more centuries. NASA will decide what to do with the aging space telescope when it's time. In case the agency decides to leave it alone, though, Hubble will succumb to the forces of gravity little by little and start reentering our atmosphere by 2037.